The Wellness Checkup takes about 15 minutes and gives you a wellness score for various areas associated with them. 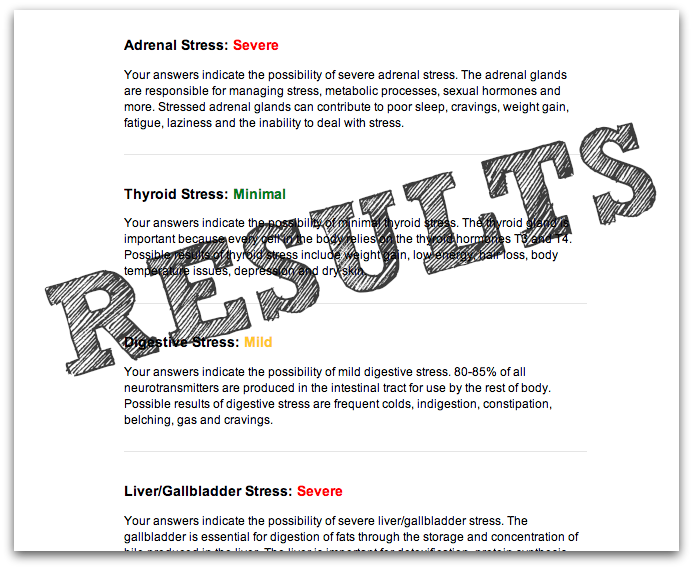 Start the checkup below and get your Wellness Scores now! I have been trying your solution for the 3:30 wake up for some time (as many people are reccomending it) but so far see no noticable results. Do you have to do this for a long time to see results??? Sandra, I filled out the weight loss version of this, and when someone called me to discuss the results, she was very helpful and kind, shared many tips for free, and did not pressure me at all. I’m considering the program, which is reasonably priced for what you get. I encourage you to try the quiz! You always have the choice to not answer the call. well I am impressed with the questions and have read some of the results and now can not wait to here from someone about my answers . I am definitely not critically ill, but somewhat concerned with what is going on in my body and mind. Guess I said it all above? I had a RAI in January 2012. I was diagnosed with Hypothyroidism a year before that…..heart rate up to 225 daily. Tried a hyper thyroid bed. didn’t work so Dr. said I would be “fine” after having a RAI…..HAHAHAHA…never have felt so crappy in my life! Was on Levo for 1/12 yrs and I just kept gaining weight and started to feel so horrible in Dec. 2013 Dr, put me on Armour. Still feel horrible! I have the book stop thyroid madness,,,have read it off & on. My Dr. is an Endo —-the “Tyhroid ” specialist I have before him in the same office, said to me 1 month after giving me the Rai & Levo said I didn’t need to see him anymore to go back to my endo down the hall. I really like him and he is open to Armour but when I go back in a month I will tell him I need more than 90 once a day! I fell horrible! Some days I just to not want to get up out of my chair! I force myself to do the menimal house chores. Thank heavens my husband is so helpful and does so much for me! So what tests should I ask to have done to get the show on the road? Looking for an endocrinologist in the Dallas area. I am not surprised at the results. I have spent three years caretaking my mother, she has Alzheimer disease. Also, during this time, I’ve been through a separation, moved to another state, and have lived in my mother’s house as well. While trying to take care of her, she had issues with hoarding; so the task has been left up to me to clean and clear it out, while trying to fix the damage of abuse to the home. I don’t like where I am living, but now I feel stuck her to finish out the situation…and hopefully sell this house. She is in a nursing home, and that leaves me feeling some guilt. I love my mom, but I don’t want to stay here…and never intended to live here this long. Since this all transpired, I am now facing bankruptcy, being overweight due to stress, and I am trying desperately not to feel lonely, in spite of having friends. It was just to much for one person to have to handle! I moved from Canada to the England to care for my dementia ridden mother. It was 4.5 years watching her slide to the grave. There is no way to describe what you go through. I don’t think I ever gave myself credit for how the stress of dealing with all this left me with terrible insomnia once she had gone. Thank you for sharing your difficulties. It has made me realize that what I had to deal with was too much also for one person – me. The price I paid was my health but I am trying to get better now. Blessings to you.